I had the opportunity to visit a local, family-owned dairy that supplies the milk to AE Dairy used to create their milks, yogurts and other products. With each of my recipes (like this avocado pasta recipe and Chorizo and Egg Breakfast Totchos), a reocurring theme throughout each article is AE Dairy’s emphasis of both family and quality. As a busy mom, family and quality are very important. Not too often do you find a family-owned company making quality products specifically with families in mind. I have written about my tour of AE Dairy headquarters and the fun time I had sitting in one of their weekly taste tests, and now I’m going to give you a little glimpse of where it all begins: milk. Less than an hour outside of Des Moines is a family-owned dairy run by Kevin and Holly Blood. Their farm located in State Center has been in the family for three generations and all members of the family play a role. While it’s only a short drive away from the city of Des Moines, many people have never stepped foot on a farm. I will admit, this was my first time visiting a dairy farm after living in Iowa for 30 years! At first glance, I noticed a clean and organized facility. 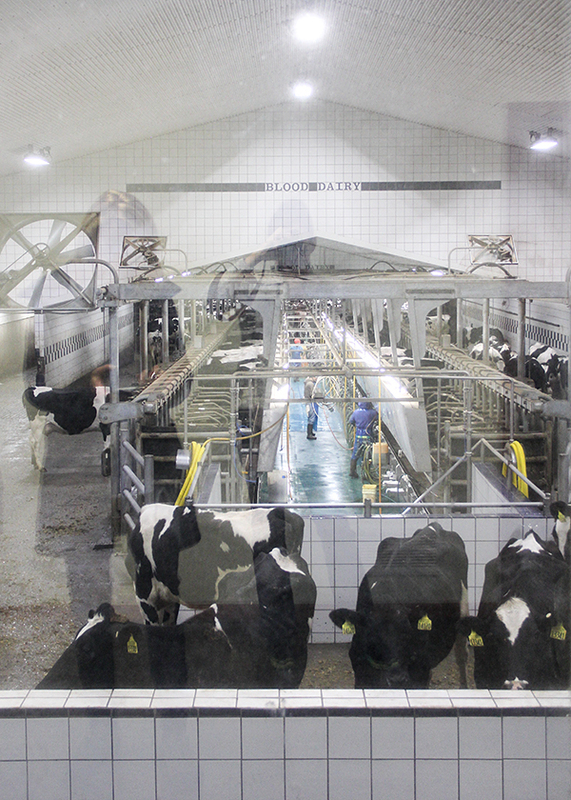 They clean the milking equipment two times a day and the floor between each cow cycle. The milk comes directly from the cows and flows through a closed system, which means that the milk is never exposed. By the end of the tour I realized the sheer amount of time, hard work, and expertise that goes into the safe production of milk is extraordinary. I also realized how many misconceptions there are when it comes to dairy. Many people think dairy cows are better off roaming the pastures. 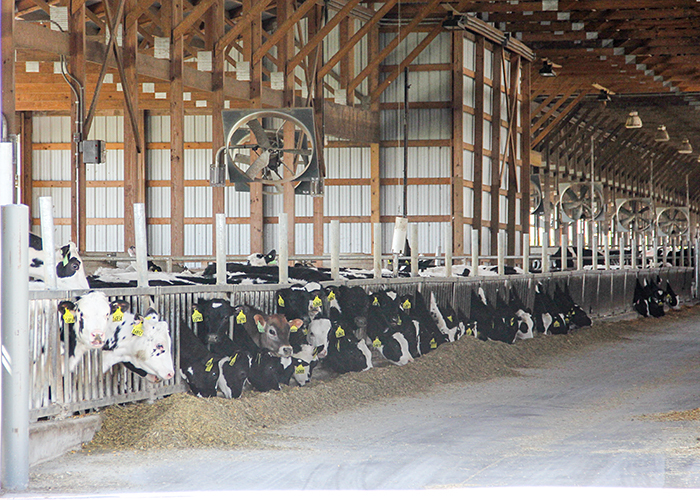 When the cows are housed in barns, they are out of the elements of the hot Iowa summers and freezing winters and kept in a comfortable temperature. I also learned cows are creatures of habit. They like having a safe place to return to after eating and they’re less stressed when they have a place to rest that’s cool and comfortable. Each cow is microchipped to ensure quality care throughout their whole lifespan including optimal nutrition – they even have a nutritionist! Think about it… a cow is roaming the pasture on a hot Iowa day, swatting away flies, fighting unbalanced nutrition, and drinking from a stream which contains who-knows-what. That environment isn’t ideal for cows or for your family who will be consuming their milk. Many families today have no idea where their food comes from and how it is handled. 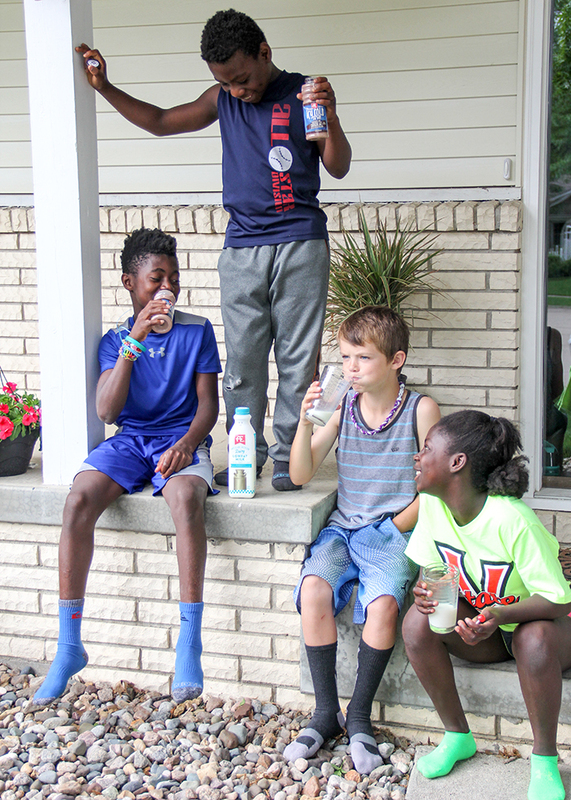 Lately I have made it a point to purchase local and from family-owned companies, especially from AE Dairy because I have now seen the entire production process! From visiting Kevin and Holly and their cows, to touring AE Dairy’s headquarters, I know who is involved in each step of the process. I know the families behind these products and it is both their livelihood and joy to bring quality products to other local families. I gave you a little glimpse into the exact milk that goes into AE Dairy’s products! Do you have any questions for AE Dairy or the family of Blood Dairy? Hey, don’t forget that milk provides 9 essential nutrients!